You are here: NECAOnline.com » Blog » News And Announcements » Who Is The Half-Blood Prince? Posted in: News And Announcements- Mar 28, 2011 Comments Off on Who Is The Half-Blood Prince? Just in time for the July 15 release of Harry Potter and the Half-Blood Prince in theaters, NECA presents two new lines of figures based on the movie! It’s Harry Potter‘s sixth year at Hogwarts, and aside from the rising power of Voldemort, the mysterious potion book that once belonged to the Half-Blood Prince, the shady doings of Draco Malfoy, private lessons from Dumbledore and the occasional Death Eater, our hero has to deal with having a crush on his best friend Ron Weasley‘s sister, Ginny. It’s a wonder he manages to keep his grades up and still have time to be captain of the quidditch team. NECA is proud to unveil these two new lines of Harry Potter action figures, the first based on the new movie and the next step in the life story of the wizard who changed the face of magic forever. Available in 7″ and 3 3/4″ sizes, each having a figure exclusive to its series, these are our best and most exciting Harry Potter figures yet! 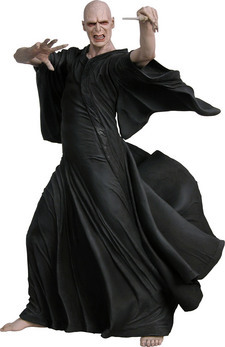 Harry Potter in Cave Scene Outfit (7″ & 3 3/4″) – After he and Dumbledore learn what it’s going to take to defeat Voldemort once and for all, they travel to a seaside cave to find a Horcrux and wind up doing battle with Inferi. Nothing’s ever simple. Figure includes a magic wand and display stand. 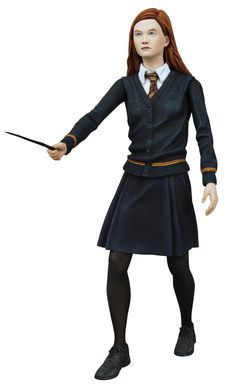 Ginny Weasley in School Outfit (7″ & 3 3/4″) – Ron‘s younger sister, Harry‘s love interest and a pure-blood witch to boot, Ginny has no shortage of roles to play in Dumbledore’s Army, which, incidentally, she named. Figure includes a magic wand and display stand. Draco Malfoy in School Outfit (7″ & 3 3/4″) – He may or may not be a Death Eater, but Draco Malfoy, like his father before him, is definitely up to no good. Dumbledore had best tread lightly. Figure includes a magic wand and display stand. 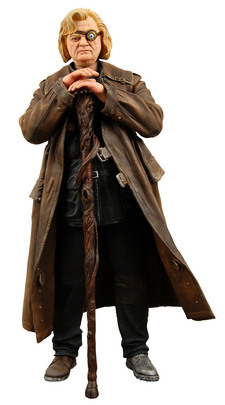 Mad-Eye Moody (7″ only) – Alastor Moody, nicknamed Mad-Eye because, well, he’s got a crazy eye patch, is a veteran of the first wizarding war and a powerful ally in the Order of the Phoenix. But just be careful because that mad eye of his, like everything else at Hogwarts, is magical. Figure includes staff and display stand. Lord Voldemort (3 3/4″ only) – In the world of Harry Potter, Voldemort is the root of all evil, and more than that, he’s almost impossible to defeat. Will Harry be up to the task? Maybe, but even the best victories come at a heavy price. 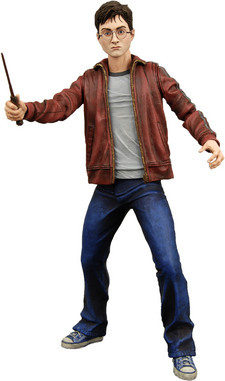 Figure includes wand and display stand.